Scientists believe they may have found the cause of the gut disorder coeliac disease. 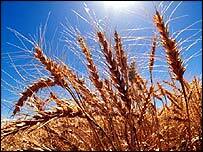 They have pinpointed a protein in wheat gluten which damages the small intestine of people with the condition. The research, published in the journal Gut, could lead to the development of a modified form of wheat which does not have the damaging protein. The disease means food is not absorbed, potentially causing diarrhoea or malnutrition. Around 250,000 people in the UK have been diagnosed as having Coeliac Disease. But experts estimate many more people with the condition remain undiagnosed. People with Coeliac Disease have a complete intolerance to gluten, which is found in wheat flour, rye, barley and sometimes oats. In the three year study, supported by charity Action Medical Research and Sainsbury's, the wheat peptide was given to four patients, and tissue from their intestine was then assessed for damage. They found that the peptide did cause tissue damage and was therefore likely to be critical in the causation of coeliac disease. Coeliac disease also has a strong genetic link, and the researchers studied 166 families that had more than one member with the condition to evaluate its true prevalence. Blood samples were taken from the families, and from some people who were not blood relatives, such as husbands or wives of the person with the disease. Tests of antibody levels and biopsies taken from the bowel showed that 5% of first degree relatives of people with coeliac disease also had the condition, compared to a prevalence in the general population of between half and one per cent. The team also used the family blood samples to study the possible genes involved in the development of coeliac disease. Professor Paul Ciclitira, professor of gastroenterology at St Thomas' Hospital in London, who led the research, said: "Coeliac disease affects a very large number of people but it can be very difficult to diagnose. "In the UK there is no routine screening for family members, but these figures indicate that it should be considered. "In many other European countries screening of relatives is automatic, and here I think it could lead to earlier diagnosis, saving the patient a lot of discomfort and the NHS money in treatments and repeated hospital and GP visits. "In the future we may be able to develop a way to work with the body's own immune system to block the inflammation and stop the symptoms completely. "A genetic test for coeliac disease may be developed that could replace the more invasive biopsy of the small intestine, which doctors currently rely on." Simon Moore, chief executive of Action Medical Research said: "This is a really tremendous result. In the future, families that are affected may be able to be screened to see whether they have the condition which will be of great benefit to them. "Remedial action can then be taken early on so that the terrible symptoms do not develop." Norma McGough of the support organisation Coeliac UK said the research was important but was just one part of the explanation for what causes the condition. "We haven't got a complete picture yet so while we welcome these findings, we still need further research. "It is encouraging that the work is going on, but we don't want people with the disease to be confused about where we are at the moment. "People still have to manage their disease by sticking to a gluten-free diet."